It was a jubilant day for 171 medical students who became doctors Friday after taking the Hippocratic Oath before their families, friends, professors and fellow students during a ceremony held in Dickson Court North. 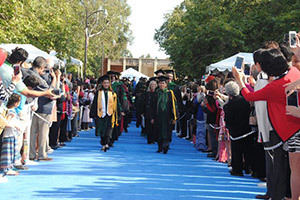 Approximately 27 percent of the 2015 graduating class of the David Geffen School of Medicine at UCLA — 46 students — became the first in their family to earn a college degree. Commencement speaker Jared Diamond, a UCLA geography professor, Pulitzer Prize-winning author and noted conservationist, joined the school’s leaders on stage. Half of the Class of 2015 is entering residencies in primary care, with specialties in family medicine, internal medicine and pediatrics. And 23 percent of the new doctors will be pursuing residencies in radiology, ophthalmology, anesthesiology, dermatology and emergency medicine. About 138 will continue to reside in California. Watch the video below and check out other 2015 commencement stories here.